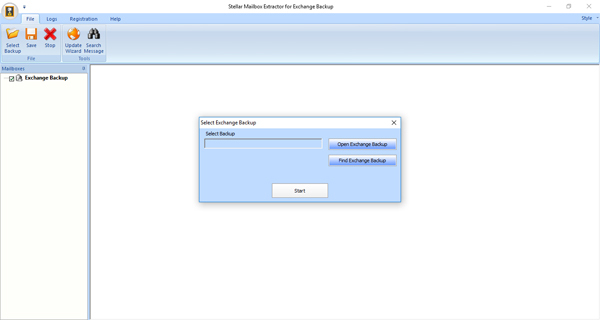 Stellar Mailbox Extractor for Exchange Backup 7.0 Free Download - Extracts mailboxes and contents are saved in backup folder of Exchange Server. Extract all your mailboxes saved in the Exchange backup database with Stellar Mailbox Extractor for Exchange Backup software. This software extracts all the content of your mailboxes, which includes e-mails, attachments, contacts, calendars, tasks, and journals from the Exchange backup file with .vhdx or .bkf file extensions. This advanced software allows you to save the extracted mailboxes and its contents either in PST, MSG, EML, HTML, RTF, PDF, or MS Office 365 files. It also provides a preview of mailboxes and mailbox items such as e-mails, notes, calendar, contacts, sent items, etc. before saving them in your desired file format. With this software, you can search for specific emails from the extracted file. Therefore, you can choose those emails from the extracted mailbox which are of importance. The software is compatible with different versions of MS Exchange Server such as 2016, 2013, 2010, 2007, and 2003. This makes the software highly compatible. It is also compatible with multiple Windows Operating Systems, namely, Windows 10, 8.1, 8, 7, Windows Vista, Windows Server 2012, 2008, and 2003. The user-friendly interface of the Stellar Mailbox Extractor for Exchange Backup makes it easy for you to use the software and extract the mailboxes and its content from the backup file of your Exchange Server. To get a preview of Stellar Mailbox Extractor for Exchange Backup, you can download the demo version. However, to avail the full functionality of this software, you need to register it. Statement: First, please download the orginal installation package by clicking the download link. Of course you may also download it from the publisher's website. Using Stellar Mailbox Extractor for Exchange Backup crack, key, patch, serial number, registration code, keygen is illegal. The download file hosted at publisher website. We do not provide any download link points to Rapidshare, Hotfile, Depositfiles, Mediafire, Filefactory, etc. or obtained from file sharing programs such as Limewire, Kazaa, Imesh, Ares, BearShare, BitTorrent, WinMX etc. Software piracy is theft. If you like Stellar Mailbox Extractor for Exchange Backup please buy it.